‘Simple and inoffensive’? Come on – are you blind?! Having worked there for some years, I can assure you it is a dreadful building to be in for any length of time. Noisy, confusing and showing its age. I worked for Amex for 19 years, the best years were working from home and working at Burgess Hill. I hated the lifts at Amex house and the fire drills. Amex house is the easiest place to catch a bug. Glad to be out of there. I worked there in the 1990s for four or five years. How the author of this page can claim it is in anyway a good building is beyond me. It is a confusing and unappealing place to spend the day. Noisy, germs fly around the building like wildfire, and I can’t think of a single person who had a kind word for the place. Out of date, getting shabby with age and a lousy piece of design. I worked at American Express when they first moved in to this building. We enjoyed this at the time! I am working there and some floors have been refurbished (the rest will follow). I think it is nice to firstly work there and also the building is not bad. Given that it is so old it was a very advanced design and I am not saying this because the architect’s son is a very good friend! I worked here for 8 years and loved it. Left in 1987’ish. Has it really got that bad since then? I worked at the old building opposite in 1973-1974. I worked in the vault area with the Cricketer, Cowboy Vic, Sir Walter Raleigh Dave and Stringbean among others. It was like a situation comedy but with no humour as such. To break the monotony within the high-security enclosure one day I put ex-lax in Stringbean’s hot chocolate. He never showed up the next day. Luckily we all saw the funny side. I work here at the moment, and I am really enjoying it. I think the people that can say never work here etc.. are mainly the people who enjoy sitting back and not doing any work. At American Express, either you work hard and get rewarded for your hard work, or you slack and therefore get nothing in return. If you would like to work in a nice place with good hardworking people -welcome to Amex.. I can’t speak for those working inside the building but from the outside I think it still looks better than many of the more recent new buildings in Brighton. An inspired design. After reading the comments of the people who work in Amex House and knowing what some people who live in Brighton think of the building, it does make you wonder how some buildings get built. The Kingswest Centre, the original Thistle Hotel and recently The Royal Alex Children’s Hospital are prime examples of poor design and functionality. What I think happens; is as follows, but I may be wrong. The architect sells their own personal vision of a statement building to senior executives that will show off the corporate image of American Express. The architect uses renderings of happy employees working and interacting in a utopian workplace surrounded by plants, light and windows with views. As the architect is a salesperson who convinces Amex that this is what they need, he also wants a statement building in his portfolio, so he will have his name against a high profile design. The internal fixtures and fittings are tailored to be as near or just over the customer’s budget to make sure the architect’s earnings are the maximum, as the architect is usually paid a percentage of the total cost for the build. Once Amex agrees on the architect’s vision of the new building; it has to get local planning permission for the structure. The carrot of hundreds of local jobs is the best lever to have when a new building needs permission; as the council politically would like to be seen creating local jobs for their re-election. What Amex have ended up with is a workplace designed by a person with only superficial knowledge what work goes on there and probably doesn’t even live or understand the town or city it’s built in. Literally out of the window has gone functionally, fit for purpose and the building ascetically fitting with the cityscape. This was on the whim of the architect and the senior executives who were sold the dream, plus a council who were not strong enough to resist. 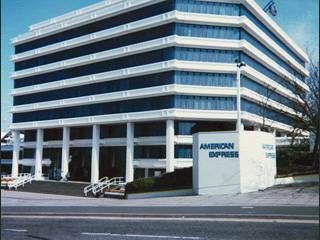 I worked at Amex from 1979 to 1989, mostly at Amex House but with 2 interludes at Prestamex in Preston Road and at Burgess Hill. I agree that Burgess Hill was a good place to work but we did get rather cut off from our colleagues. Unlike some of your other comments, I did not dislike Amex House, and the 8th Floor was a particularly good area to work. I recall the morning after the ‘hurricane’ of 1987, when some of us rushed around covering the computers etc on the 8th floor because part of the roof had blown off. I don’t live in Brighton any more and only just heard about the new building and the plans to replace Amex House. Mixed feelings, I spent happy days there! Did anyone work in the old building in 1969? I worked with Barbara Nash. My first job was in ETAC (European Travel Accounting Centre) back in 1970 in the old building at a monthly salary of £45.00. It was very social as people from my department would go out together on a Friday night to pubs in Brighton like the Queen Anne in West St, The Druid’s Head & The Pump House. The Marlborough pub too was popular at lunch times. There would be a Christmas party laid on and a summer event too. Geoff Hampson was our supervisor. Names I remember are Brian Dougherty, Janet? Dave Andrews, Dave Cook, Harry (from Holland), Hilary Nash, Peter de la Nougere, Britt Dixon. I later worked in Personnel with Marion Gillard for Mr Nesbitt. He used to take us out to the Pump House at Christmas for a steak lunch. Other names I remember are Mr Butler & Mr Warren, a very funny man – you always called the senior managers by their surnames then. We had Luncheon Vouchers and tea was brought round by Betty the tea lady in the afternoons. I believe it is being demolished in the next few years, they’re rebuilding with a mixture of housing and offices. To Hilary Gould; it sounds like you used to work in CAD – I worked in CSD (but all part of ETAC). Crazy days on Edward Street and, yes, oh dear, lunchtimes in the Marlborough (where they accepted LV’s for beer). I worked there when it first opened. I was young and I loved it there, I thought it was a great place to work and we had lots of fun. Happy days. I worked there in 77 and 78. First in Travelers’ Cheques on the 3rd(?) floor – I was a dab hand with the calculator, and used to take the batches of cheques over to the NatWest to be dealt with. Later I got a job in the 1275 room (the extension to the right as viewed from the street). Exciting times, and we always felt a bit special as (a) we worked shifts and (b) we didn’t have to wear suits. For us, the Market Diner was always popular, as it was one of the few places you could get a fry up at 4am – which was our lunch break! Playing football on the seafront in the pitch dark was another lunch time entertainment. It was a great place to be at that time – we worked hard, we were well paid and the social life was exciting too. I even met my wife there. I worked in the old building from 1968 until 1973 in the IT department – from Tape Librarian through to Senior Programmer. Almost 2 years of this time was spent in Zurich programming with a small team. I loved my time there and have great memories.